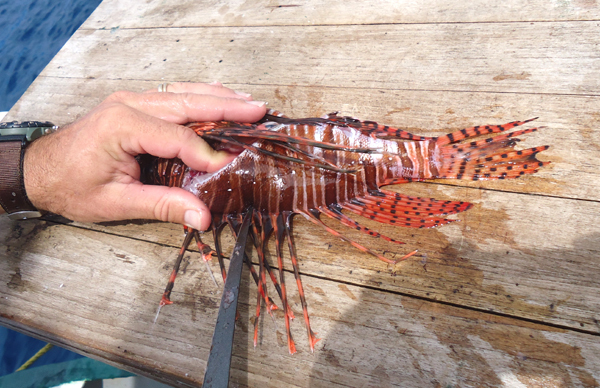 While some people like to clip the spines off of a lionfish prior to cleaning, they can be safely filleted with the spines on as long as care is taken. 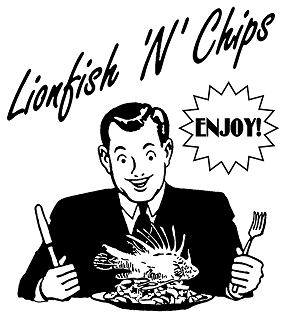 Gloves can be worn for added protection although some dexterity is lost by wearing them. 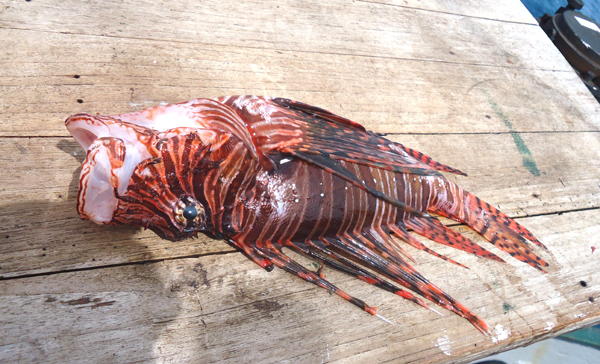 The basic process of filleting a lionfish is similar to filleting most other fish, but one must be careful because even a dead lionfish can sting. The venom is located in a pair of parallel grooves that run along the spine, and envenomation occurs when the sheath is depressed as it enters the victim. 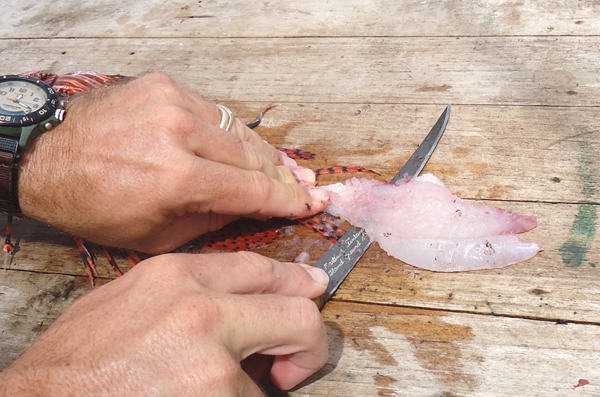 This process tears the glandular tissue allowing the venom to diffuse into the puncture wound. A few of the spines do not contain the toxin, however it’s best to treat each one with caution. The above photo shows the most hazardous spine to watch out for when cleaning. 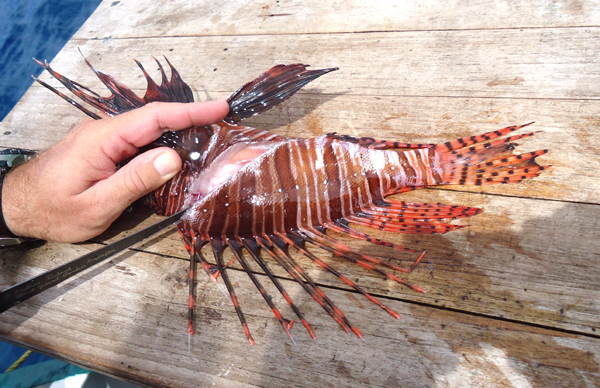 This small spine is on the end of the pectoral fins and is problematic because it is much smaller than the others and it tends to poke you when sweeping the others out of the way. Watch out for this spine! 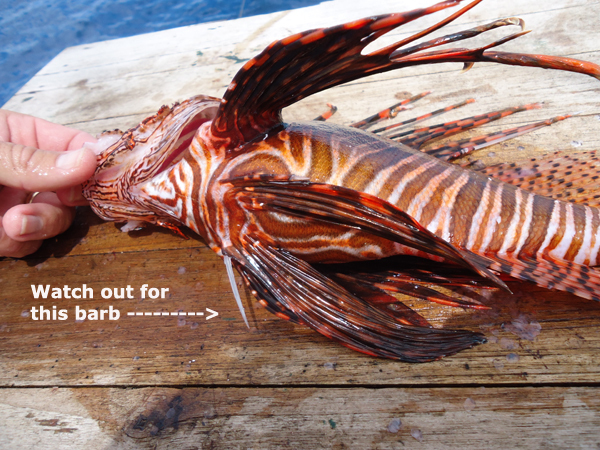 Watching out for the short barb, carefully lift the fin out of the way to prepare the first cut behind the gills. 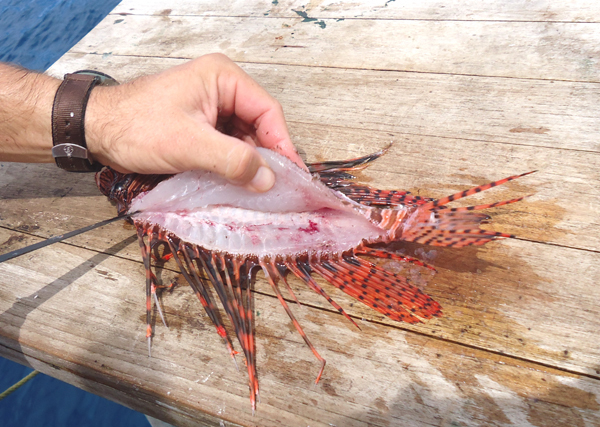 Cut down to the spine at an angle behind the gills and fin as shown in the picture above. 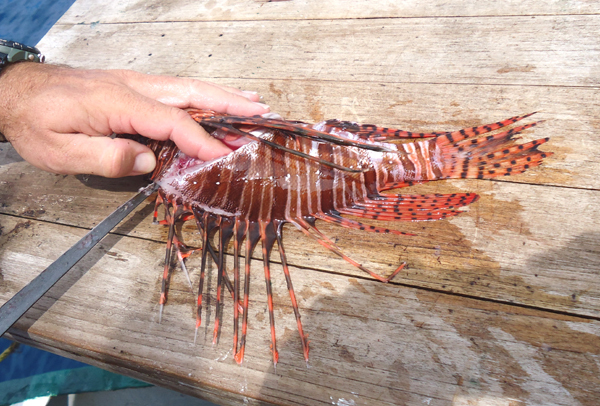 Carefully cut along the dorsal fin on the side from which the fillet is being removed. Cut along the dorsal fins up to where the first cut was made. 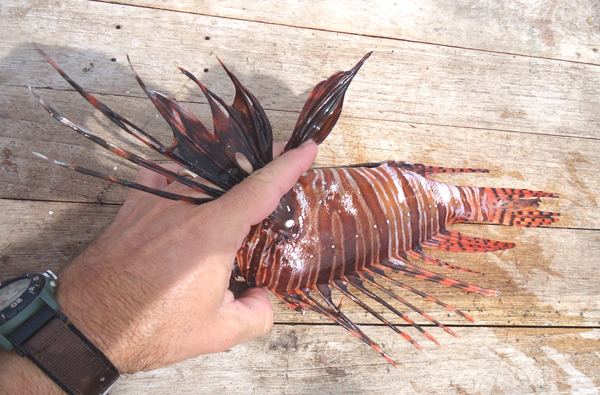 Extra caution should be used when cutting along the dorsal fin to ensure that your fingers don’t accidently poke the tips of the dorsal spines. 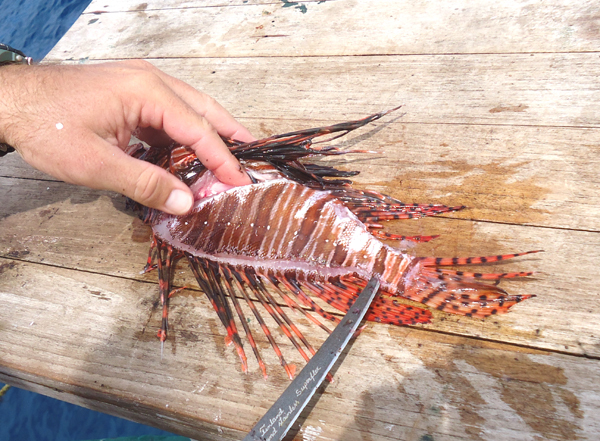 Work the knife back carefully towards the lionfish tail, sliding the knife through just above the bones and below the meat. 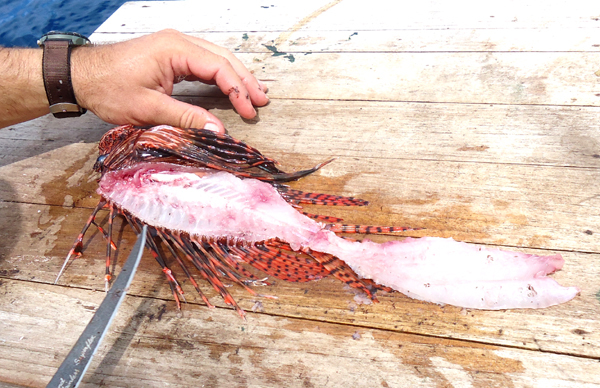 Once the cut has been made all the way along the lionfish dorsal the fillet can be opened up for trimming. Trim the fillet along the bones and connect the cut with the first one made behind the gills. Once the meat has been trimmed off of the bone the fillet can be laid over towards the tail so that the meat can be sliced off of the skin. 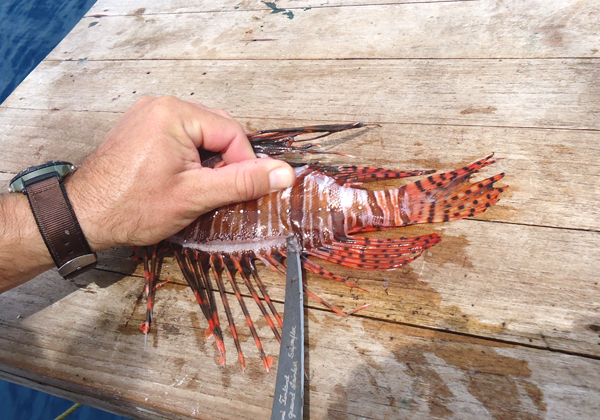 After trimming the meat off of the lionfish skin, flip the lionfish over and repeat on the other side.